The Martian. Andy Weir. New York: Broadway Books, 2014. Summary: Mark Watney, left by his crew for dead on Mars, survived a potentially fatal incident and must find a way to survive on Mars alone until he can be rescued. The story of this science-fiction novel is a thriller in its own right. Self-published e-book by nerdy programmer becomes best-seller and is not only picked up by a major publisher but also picked up by a movie studio for a film, soon to be released (October 2 in the US), starring Matt Damon, as the main character, Mark Watney. I have no idea if the movie will live up to the hype, but I understand the excitement. 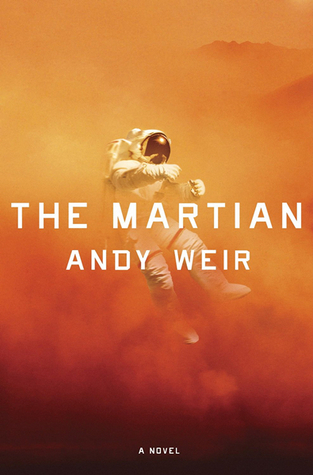 Andy Weir has created the killer combination of a page-turning plot and a likable space engineer in a modern day Robinson Crusoe story where death by food or oxygen starvation or catastrophic equipment failure seems the most likely outcome. Quick summary of the plot: The Ares 3 mission to Mars is progressing well until a violent sandstorm necessitates a crew evacuation of the planet. As the crew makes their way to the launch vehicle, Watney is speared by a wind-blown antenna, piercing his suit. Telemetry indicates he’s lost pressurization and life signs. Unable to locate the body without risk to the crew, the rest launch. Only Watney isn’t dead, and when he regains consciousness, he also realizes he is alone on Mars and facing a survival challenge. Fundamentally, he does not have enough food to survive until a rescue mission can be mounted. He cannot even communicate with earth, although their Mars satellites eventually provide mission control with the information that he is alive. Watney is an engineer and the next couple hundred pages essentially reflect his efforts to “work the problem” including setting up a potato farm in the “Hab” where he lives, recovering a probe that allows him to communicate with earth and eventually modifying a Rover-type vehicle to make a hundred day journey to a launch vehicle so that he can attempt a rendezvous in space with his crew who has taken an extra loop through the solar system to attempt picking him up, risking their own lives. A series of mishaps and an unforgiving environment at various points mean losses of food, communication, and even jeopardize rendezvous. And this leads to the second strength of this book, a likable character who just keeps picking himself up (literally at several points) and who brings a very creative engineering mindset to bear on his problems. Much of this also reveals the technical expertise of Weir who figures out what would be available on such a mission and how to use it to survive. Through all of this we see a character who combines dry humor with shrewd intelligence, not only in his ingenious fixes but also in relating to the crew who left him behind and struggles with their guilt in doing so. It has been a long time since I read Robinson Crusoe, but my sense of what distinguishes the two books is that this is a page turner, but that it lacks the interior depth of Defoe’s Crusoe, in his reflections on the human condition. Watney spends his free time watching ’70s re-runs, reading Agatha Christie mysteries (not a bad choice) and complaining about his commanders love of disco. I suspect most audiences will relate more readily to Watney than to Crusoe, a commentary in itself. Nevertheless, I found myself rooting for Watney, turning the pages to see what fix he would come up with next and whether it would all turn out alright in the end. It was a wonderfully diverting experience to read this page-turner that was so well-researched.